Pit bulls receive a great deal of negative media attention, which over time has darkened public view of the breed. Pit bull advocates struggle to get positive stories heard over the roar of the nearly constant negative hype. To highlight the positive aspects and historical significance of the breed in American history, pit bull advocates often reference famous pit bull owners, such as Fred Astaire, President Theodore Roosevelt, and Helen Keller. Pit bull detractors refute the assertion that Keller’s dog was a pit bull, and while there may be no way to verify either claim, photographic evidence indicates that Keller owned at least one pit bull, and possibly several. However, whether she owned a pit bull or not is not the key point. Helen Keller had many dogs throughout her life and she believed in the healing power of their companionship. Stricken by illness as a baby, she was left both blind and deaf and struggled to communicate and understand the world around her. As she worked to overcome her challenges, Keller quickly recognized the comfort and healing that companion animals provide. She said, “My dog friends seem to understand my limitations, and always keep close beside me when I am alone. I love their affectionate ways and the eloquent wag of their tails.” Keller understood that dogs are intuitive, social animals that respond to human emotions and crave human companionship. Keller’s relationship with her dogs demonstrates the symbiotic bond between canines and humans—she provided her dogs with food, water, exercise, and love, and in return they offered her unconditional love, loyalty, and therapeutic companionship void of judgment and replete with patience. Broadway Barks recently visited the Royer-Greaves School for the Blind and witnessed a truly amazing program demonstrating how this therapeutic bond between dogs and humans is as strong and as necessary as ever. Helen Keller pictured with two of her many dogs. People debate whether these dogs were pit bulls; However, both dogs possess many qualities of the bully breeds such as body size, shorter legs, muscular build, shortened muzzle and short neck, and a broad head shape. A cursory visual examination would lead many people to classify these dogs as pit bulls today. On a sunny and warm spring day in small-town Paoli, Pennsylvania, pit bulls visited the students of the Royer-Greaves School for the Blind and offered therapeutic nuzzles, encouraging tail wags, and gentle kisses. Socializing with teachers, dog handlers, and each other, as well as interactions with the nurturing and attentive pit bulls, gave the students companionship as well as auditory and tactile stimulation, which is integral to their development and well being. 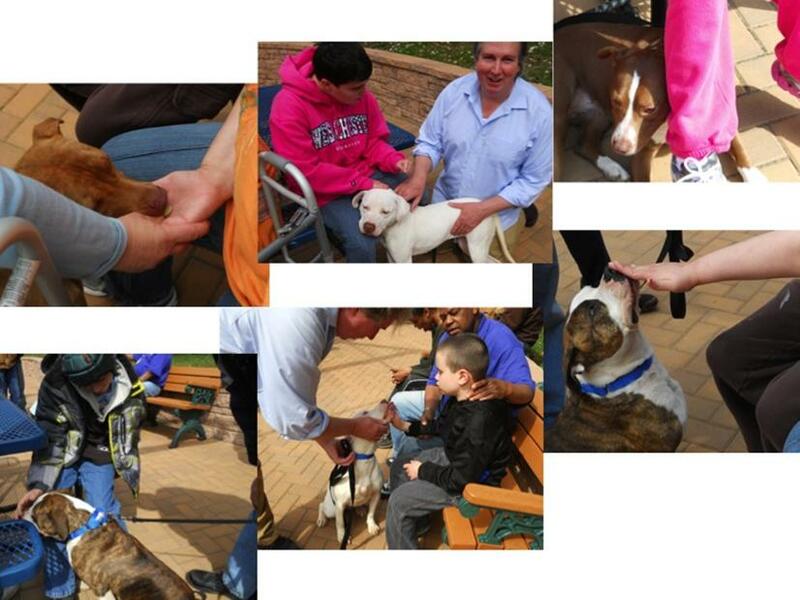 The students enjoyed feeling the dogs’ soft ears and wet noses and tongues. Some of the students petted the dogs from head to tail, discovering the shape and size of each dog. The dogs thrived with each gentle pet the students gave them, and the extra attention and belly rubs provided them the socialization and companionship they need. It was a win-win situation for every human and canine involved. Along the way, many minds were changed about pit bulls and, for some, the importance of the human-canine bond was rediscovered. In the school courtyard, the students sat on benches and at picnic tables while handlers guided the dogs to each student. All the students are blind, and many have multiple physical or developmental disabilities, such as autism, which make standard human communication difficult. However, the dogs dissolved the communication barrier as they laid their heads on the students’ laps for extra pets and scratches behind the ear, or sat patiently while the students caressed their faces to make sense of what they were touching. The handlers ensured that the dogs interacted with everyone, and they made several rounds; however, quick bonds were forged, and the dogs often gravitated to the most challenged students, guided by instincts not yet fully understood by humans. As for the students, their reactions to the dogs varied. Some students began the session a little hesitantly, but after meeting the first dog their faces brightened and happy squeals of laughter rang through the courtyard. Other students began the visit agitated or restless, but became calm and contented after petting the dogs. 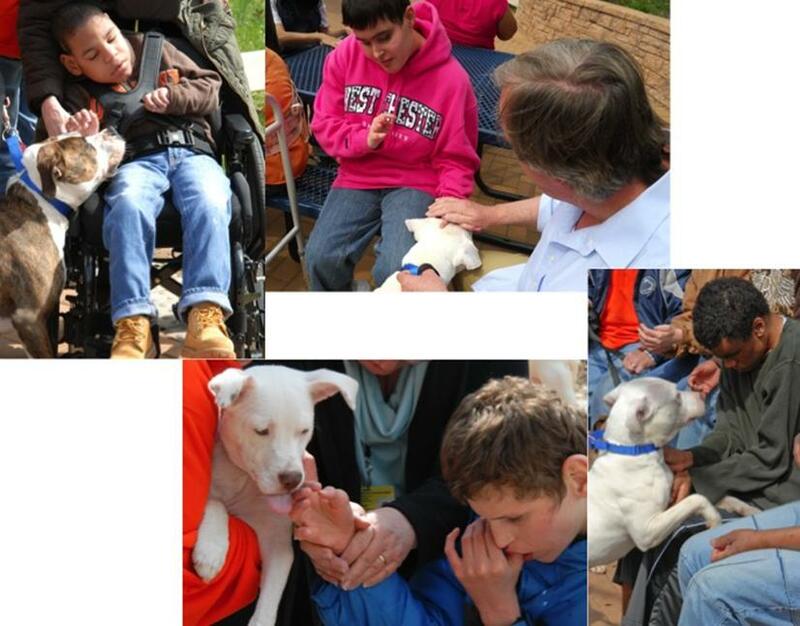 Top left to right: A student gives Jerri a treat; MLAR founder Bill Smith with Dresden as she puts her chin on a student’s lap; Annalee leans her head against a student’s leg. Bottom left to right: Vinnie leaning in for petting; Dresden licks a young student; Vinnie stretches to reach a student’s extended hand. 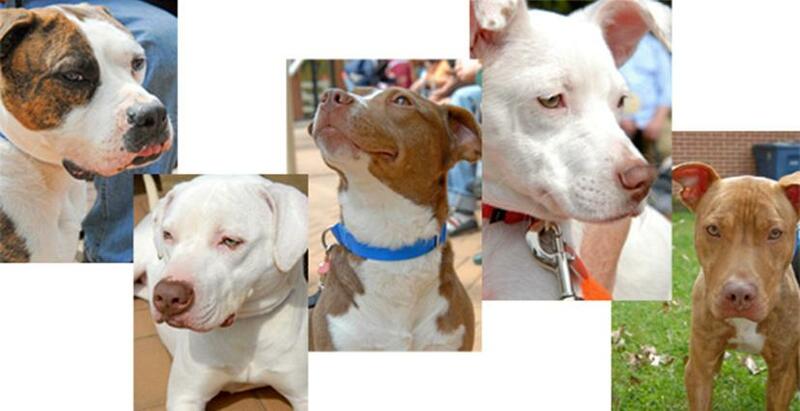 The dogs come from the Main Line Animal Rescue (MLAR) in nearby Phoenixville, Pennsylvania. 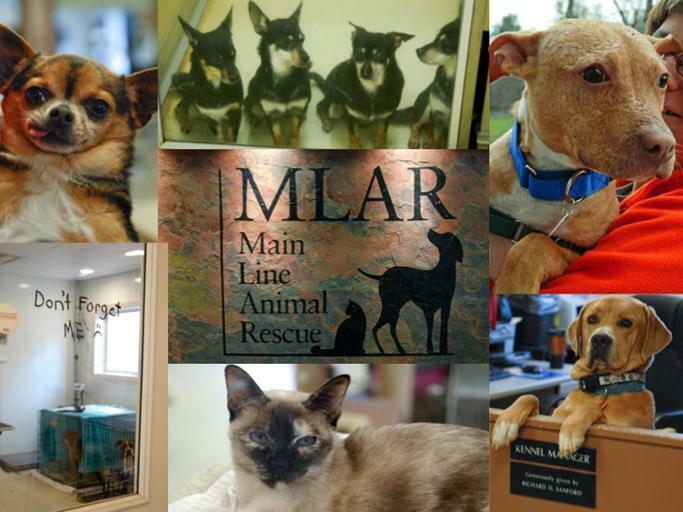 Many people believe MLAR is the finest animal rescue in the United States. 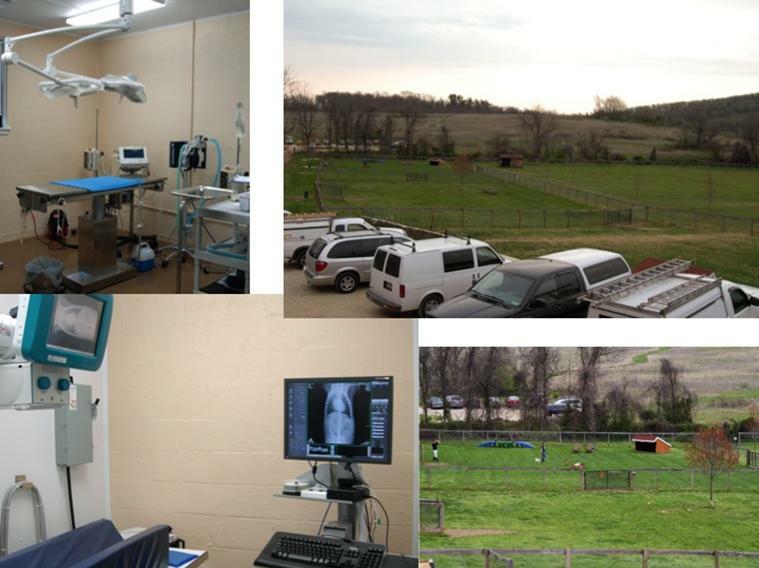 MLAR boasts several hundred volunteers, more than a thousand animals adopted annually, a state-of-the-art veterinary clinic, innovative training and educational programs, and nearly sixty acres of fenced pastures and walking trails. Some of the pit bulls came to MLAR from abusive situations, and a few of them suffered horrendous injuries requiring surgery and extensive treatments, yet they remain loving and gentle animals that want nothing more than to sit in someone’s lap and share their companionship. The staff and volunteers at MLAR train the pit bulls (and all the other dogs in their care) in basic obedience skills such as “sit,” “stay,” and “lie down.” But what is so incredible about these therapy pit bulls is that beyond their obedience training, they have no specific training as therapy dogs—they just instinctively know what to do. During our visit, several of the dogs gently approached the students and then leaned forward as if to urge the students to pet them. A young female pit bull named Annalee sat next to one student and leaned against her, which seemed to calm the student’s rocking. As one might imagine, a group of students, teachers, dogs, dog handlers, and photographers can get pretty loud and chaotic, but the pit bulls remained calm, gentle, and focused on the students through all the excitement. Several of the school’s staff and assistants said their views of pit bulls changed since the beginning of this program. They admitted to thinking of pit bulls as dangerous menaces, but now they see them as loving dogs with an extraordinary gift for relating to people with disabilities. Royer-Greaves Executive Director Dr. Joseph T. Coleman admits that he was hesitant about using pit bulls as therapy dogs, but was willing to try anything to help his students. From the school’s courtyard, right in the middle of the pit bull and student action, Dr. Coleman shared with Broadway Barks how his mind was changed about the pit bull breed: “I’m kind of floored by the whole thing because I was one of those people who had the typical mindset of what a pit bull is—something you avoid, something you stay away from—but I was really in awe of how gentle and well-behaved the dogs were and how well they interacted and how they allowed the kids to approach them…it wasn’t my typical mindset of a pit bull.” Dr. Coleman believes in the program’s benefits so much that the pit bull visits have been made a permanent “pet and play” activity at Royer-Greaves. After talking with Smith, it is obvious that he truly cares about people and every one of the animals that come into MLAR’s care. As Smith himself stated, “We have an incredible staff, we have all these volunteers, and the only thing I still have total control over is the placement of the animals. I have to meet and talk to every person who takes an animal out of this shelter and everybody knows it…Once an animal enters our program it’s a partnership, and we feel like we are responsible for them forever.” Even though Smith is willing to care for these animals for as long as they live, it is MLAR’s goal to get them all adopted out. All of the pit bulls in the Royer-Greaves program are ready to be adopted and, as with all the animals at MLAR, they have had basic obedience and good socialization training, which is why people from all over adopt their pets from MLAR. Two wonderful organizations, the Royer-Greaves School for the Blind and the Main Line Animal Rescue, have joined together in The Pit Bull Therapy Program to better the lives of both humans and dogs. Smith and the staff and volunteers at MLAR knew the wonderful therapy work that pit bulls could do, and the staff of Royer-Greaves, although nervous at first, trusted MLAR in an effort to enrich the lives of their students. It worked. Just as the students of Royer-Greaves might be harshly labeled and misunderstood, the therapy pit bulls have had to overcome extra challenges in their lives and in the perceptions people have of them. Instinctively, these children and animals connect on a deep and meaningful level—the dogs provide socialization and stimulation in a comforting, non-judgmental way, and the children give love, affection, and attention to dogs that have often been abused or tossed aside. It’s hard to know who’s getting more out of this relationship, the children or the dogs, but we can all learn something from the way they reach out to help and comfort each other. Do you have an inspirational story, or a topic you would like to know more about? If you do, just leave a note here or email us at barkers@pitbullinteractive.com. We’ll find the experts and get you some answers! amazing amazing story! We have a pit mix from MLAr and I teach children with multiple disabilities! You have inspired me to use Maverick (our pit) in my classroom! “I was one of those people who had the typical mindset of what a pit bull is—something you avoid, something you stay away from…” That quote said it all for me. I was also one of those people. I was afraid, too. But, almost accidentally, I got into transporting dogs from “death row” in New York to their new homes, and not surprisingly almost all of those dogs have been pit bulls. Needless to say when you’re with a dog for hours on end in the car, you get to know some things about them. One thing I can say about EVERY SINGLE ONE of the nearly 40 pit bulls I’ve transported: they all ended up in my lap, craving human touch. So loving — like no other kind of dog I’ve ever met. I can’t think of a better therapy dog type, if there is one. This is just a wonderful and insightful story. I love when minds are changed for the better.